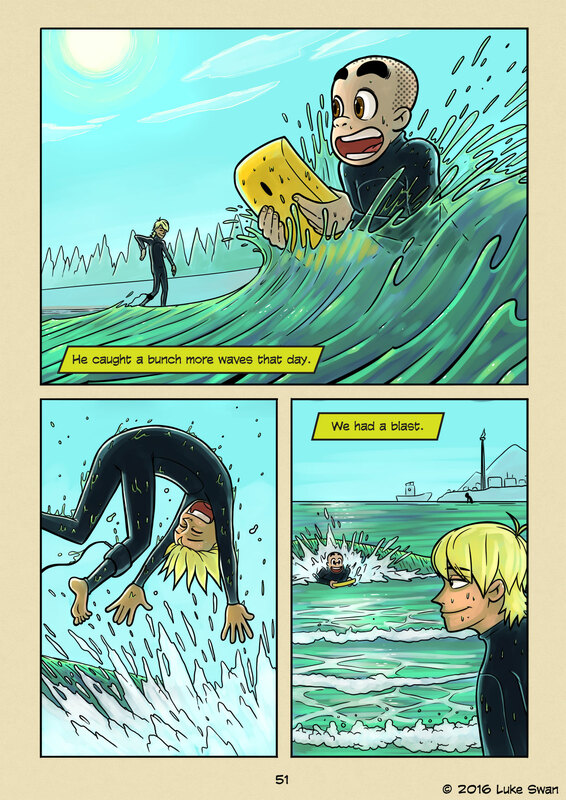 The Importance of Having Fun (#051) | Web comic "Surfer Joe"
I was paid a visit by a friend the other day. He was someone I hadn’t seen in a couple of years. We met at the beach when my leash snapped on a pretty good day. He was heading up to the parking lot when he saw me fiddling with my leash on the shoreline. He gave his own. I remember feeling pumped for the rest of that week because of the kindness this stranger had shown me. We surfed together a few times after that and I started to get to know him a bit. I found out he was a retired surfboard shaper. His surfboards are a thing of beauty. I could tell the first time I saw one of his boards. It’s a shame he’s retired. We fell out of touch after a while, then the other day he called me up and wanted to meet. So I had him over for coffee. It was good to see him. We talked about a number of things, mostly revolving around surfing and surf culture. We talked about a number of things, mostly revolving around surfing and surf culture. I remember him saying that in Japan, surfers are considered “bad people”. This was an interesting comment and something I’ve been hearing a lot recently. I told him what I thought. I think society places a certain expectation on people. We’re trained from a very early age to fit into a system. From grade school through college we are told to keep our heads down and study what society has prepared for us. When we are done with school we placed into this system, which we work to contribute to the economy. Most of us don’t like it, but we do it out of obligation. To who or what is anyone’s guess. We feel guilty if we don’t work late or weekends. Many of us work sick or take work home with us. All in the name of being productive, and having “worth.” It’s a system built on material values, and our contribution to it determines our value. And Japan’s system is the harshest of the harsh.